These Kem Casino Playing Cards are made entirely of Cellulose Acetate Plastic. They have been used by casinos and card rooms in over 60 countries for nearly three quarters of a century. 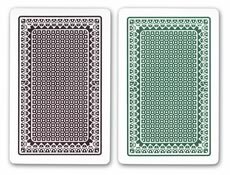 You can choose from narrow size (2-1/4" x 3-1/2") and wide size (2-1/2" x 3-1/2") Kem Casino Cards. 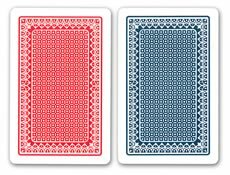 Two-deck sets are available with Red/Blue and Green/Brown backs. For additional information or wholesale pricing on Kem Professional Playing Cards, please call 1-800-233-0828. Click on the links above to browse particular brands and styles, and to get volume prices.